This is THE VIDEO SERIES bought and used by many performers and trainers, Clinton Anderson, Steve Jeffreys (Australia), Otto Bernd (Germany), Linda and Steve Duchac, John Lyons and Parelli - certified trainers, Arabian Nights, and many, many more! to teach so that you have success! They are for people of all ages, disciplines and all levels of experience. THE ONLY DVD SERIES OF ITS KIND! 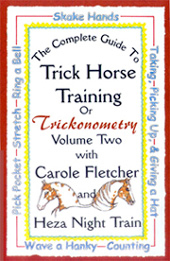 Volume 1: The first DVD in this series covers the history of trick horse training & Carole’s philosophy of teaching tricks with the 3 P’s: Patience, Perseverance & Praise. Simple tricks begin the program: acting ashamed, putting your head on my shoulder, kissing, answering “No” & “Yes,” smiling, & pushing, or “drunkard’s shove.” Tricks using the horse’s mouth are continued in this video, with taking a hanky from your pocket, taking a hat off your head, picking up a hat & giving it to you, ringing a bell, & waving a hanky. Then the horse’s feet are brought into the act with instruction in shaking hands, counting & stretching. Volume 2: DVD 2 will show you how to teach your horse to drink from a bottle, serve drinks, untie knots, push a baby carriage or lawnmower & roll out the barrel! Then progress to bowing on one knee while dismounted & mounted, kneeling on two knees, the Arabian prayer & camel stretch. 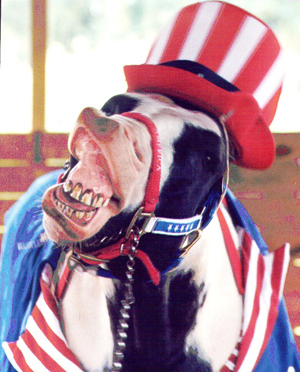 As each of these videos builds on tricks learned in preceding tapes, now your horse will easily learn how to pick up trash & put it in a barrel, play basketball, wave a flag & spin a rope - all taught in this tape! 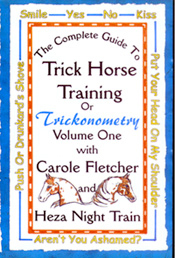 You’ll also be able show off your h orse’s math ability with tricks using his counting skills. Then he’ll learn how to wave a foreleg -“Hi,” lie down & play dead, sit up & be mounted, finishing with your horse rising with you aboard from a sit, to stand. Sensational! Volume 3: Now that your horse has a thorough foundation in trick horse training, you’re ready to progress to the stuff of circuses! Your horse will learn to perform the curtsy bow, crossing legs & pivoting in both directions, adding the curtsy to the pivot, pivoting with one foreleg extended, the march or Spanish Walk, hesitation march mounted & dismounted, & beginning work on the pedestal. Continuing on the pedestal, your horse will learn how to “strike a pose,” with three spectacular silhouettes: the Statue of Liberty, End of the Trail & Bottoms Up. Work on the pedestal continues with a pivot with 1 leg extended, & crossing legs & pivoting w/a curtsy. More “business” is added with work on a teeter -totter & gangplank. The last chapters include learning to rhumba, rearing & standing on one leg & walking on the hind legs. To see a variety of tricks that you will be able to teach your horse click here.